An ingrown toenail is a common condition that involves the corner of the toenail growing into the skin of the toe, causing pain, swelling and infection. This can occur as a result of wearing shoes that are too small or tight, cutting the toenails too short, injury to the toenail or a naturally curved toenail. 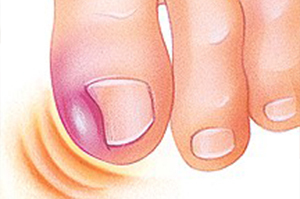 While this condition can affect any toe, it most commonly affects the big toe. If left untreated, an ingrown toenail is likely to develop an infection and may even require surgery to remove the nail. Ingrown nails may cause pain at the tip of the toe or all the way to the base of the toe. The pain is often worse while walking. An ingrown nail may also lead to infection, inflammation, or a more serious condition. If it’s infected, you might see puss or redness. Most ingrown toenails can be treated at home by soaking the foot in warm water, applying antibiotic cream to the area and wrapping the toe in gauze or bandages. It is important to keep the area clean to help prevent infection. Your doctor may also place a piece of cotton under the nail to separate it from the skin that it is growing into, encouraging growth above the edge of the skin. For more severe or recurrent cases, part of the nail and the underlying tissue may be removed in order to remove the infection. Removal can be done through a chemical, laser or other methods. Proper Trimming: To avoid problems, trim your toenails straight across without cutting down into the corners. If you can’t trim your own nails, ask your podiatrist to do so for you. Patients with diabetes may be at a higher risk for infection or other complications of ingrown toenails, and should take special precautions to prevent them from occurring. To learn more about Ingrown Toenails & Podiatric Services, please contact us at 410-749-0121410-749-0121 today or click here to schedule an appointment.